Purina Yesterday’s News cat litter is an environmentally responsible alternative to less “green” cat litter alternatives. As a paper-based product, Purina claims that Yesterday’s News is made primarily using recycled newspaper. The environmental benefits of Yesterday’s News cat litter, though significant, are only one of the beneficial properties of this cat litter. Yesterday’s News absorbs liquids, such as cat urine, very well. Purina claims that Yesterday’s News absorbs three times as much liquid as clay cat litter. Though I haven’t measured this in any scientific fashion, it does appear to me that the paper-based litter absorbs more than the clay litter does. Though Yesterday’s News cat litter does not form a clump in the litter box like the scoopable cat litters do, it is generally not difficult to clean the litter box. I simply push the clean pellets to one side and scoop the liquid-soaked pellets with a regular cat litter scoop along with the cat feces. I notice very little odor when I use the Yesterday’s News cat litter and I like the fact that the litter is unscented, making it more pleasant for my cats to use. It is also totally dust-free, which another pleasant and healthy benefit for my cats. While the texture of Yesterday’s News is a bit different than the scoopable cat litters and other clay-based litters, it does not deter my cats from using the box. With six cats in the house, it is important that they do use the box and this was something I was concerned about the first time I tried the Yesterday’s News. Fortunately, my fears were ungrounded and my cats use the litter just as regularly and as readily as the scoopable litter we normally use. Yesterday’s News is also an alternative for cats that have had surgery or who have other wounds that need to be kept clean and dry. For these cats, clay based litters can sometimes pose a threat by contaminating the wounded tissue. Yesterday’s News is a safer product for these patients and I recommend it regularly to my veterinary clients who find their cat’s in this situation. This is especially true for cats that have had surgery or wounds to their lower legs, feet or toes. Though Yesterday’s News is sometimes used only temporarily for cats with healing wounds, it can be used on a permanent basis as well and works well for most cats. 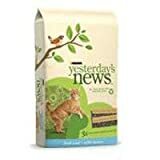 Yesterday’s News Original Cat LitterYesterday’s News brand litters are made with recycled newspapers so they’re environmentally friendly. Yesterday’s News is 3x more absorbent than clay litter for highly effective odor control. Plus, it’s 99.7% dust free and there’s low tracking.Available in 5 lb., 15 lb. and 30 lb. bags. Find more Yesterdays News Original Cat Litter products on Amazon!